The first thing I did (of course) was to fire up DCS: A-10C Warthog (beta) and see what I could see. As promised, it recognized that I had a Thrustmaster HOTAS Warthog installed and it automatically set all of the switches, toggles, and buttons to the proper authentic A-10C functions. The seamless integration of the Warthog with, well, the Warthog is a great feature. I’m not a big fan of building profiles for HOTAS(es?) so the fact that the default Warthog assignments happen to match the real airplane’s settings was perfect for me. Why reinvent the wheel? I spent several hours trying out all of the HOTAS functions and watching in amazement as the simulator mirrored every button press and switch movement. It is very impressive. I have to admit I was a bit skeptical about how cool it would be to have an APU START switch on the throttle base, but after flicking a switch on the HOTAS Warthog and seeing the same switch move in the virtual cockpit, and after watching the APU EGT rise and hearing whine of the turbine starting — I was sold. After several hours I thought I had finally found something legitimate to gripe about. While using the mouse axis “mini stick” on the back of the right throttle lever I found that I couldn’t precisely control the Targeting Pod or Maverick slew rate enough to accurately target objects while on the fly. Of course, DCS: A-10C Warthog is so thoroughly modeled that I discovered during one of the tutorials that you can set the slew rate of the targeting pod by keying in a smaller number on the MFD using the Up Front Controller (UFC). Problem solved. The stick is simply awesome to use. The automatic mapping of the CMS, TMS, and DMS switches is great. 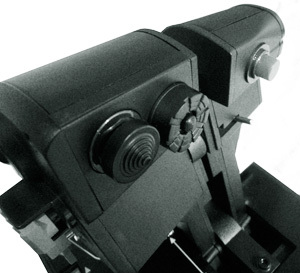 The dual stage trigger helps stabilization (PAC-1) for gun runs with the 30mm Avenger. I don’t know if it is the smoothness and accuracy of the stick or pure placebo effect, but my strafing runs with the HOTAS Warthog were markedly improved over my performance with my old controller. The lack of slop in the middle is probably a big factor coupled with the greater tension in the Warthog stick that tends to help keep the whole affair much more steady while squeezing the trigger. 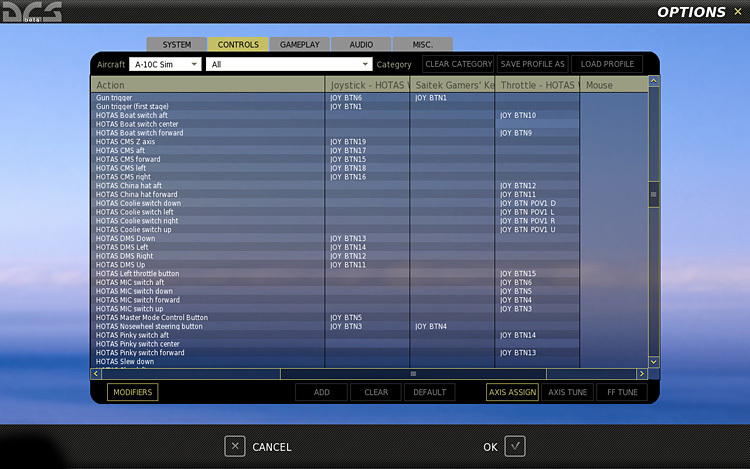 For a game with complex HOTAS commands such as those used in DCS: A-10C Warthog, the automatic profiling in-game is a big time saving feature. Particularly for someone like me who is not very good, or doesn’t want to spend the time learning advanced programming features for their shiny new hardware. For instance, I would have no idea how to program the “long” button pushes required to utilize the “China hat” on the Warthog throttle. The “long press” is an extended button push that creates a different function from a short press. On the A-10C throttle you can press forward on the China hat for a long press and the command will be sent to the Targeting Pod or Maverick seeker to slave itself to the current selected waypoint. It can be argued that a sim enthusiast that is willing to spend $400+ USD for a game controller would also be the type of person that would want to learn the programming software (TARGET) but in my case my interest far exceeds my available time these days. 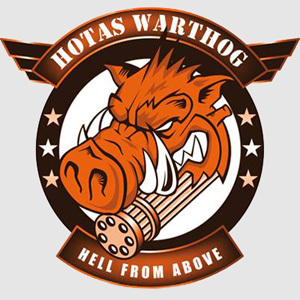 Basic profiling is not difficult though and for those that want an easy controller to setup the HOTAS Warthog can be as simple or as difficult as you chose for it to be. There are a few things I find lacking in the HOTAS Warthog however, but they are not really the fault of Thrustmaster so much as design requirements and concessions. 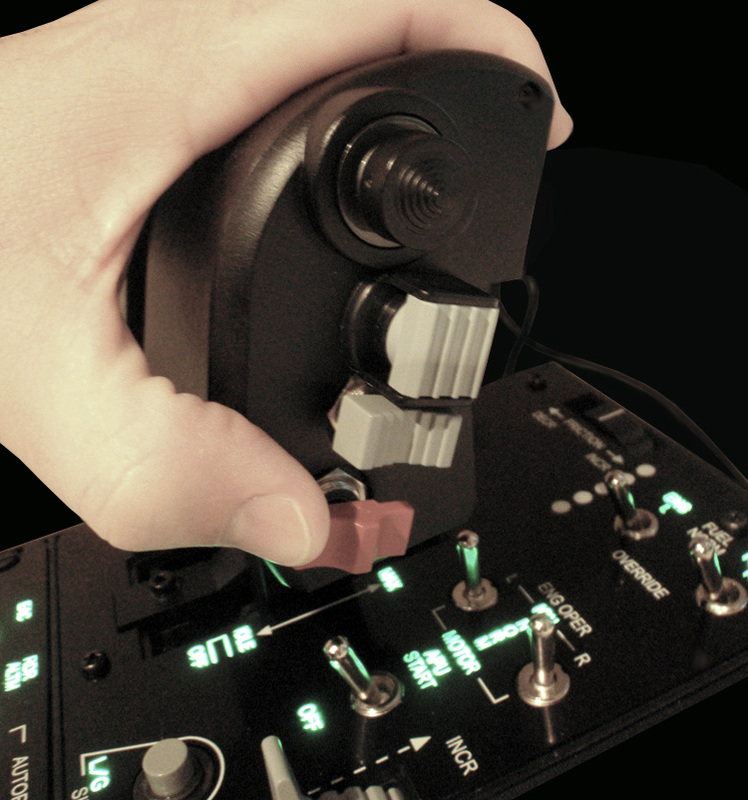 The first observation is that the dual throttles, though accurately modeling the actual real-life throttles in the A-10C (and F-15 apparently), are actually not as ergonomic and comfortable as the more contoured Saitek X-52 throttle. Realistic yes. Comfortable for extended throttle use for something that requires a LOT of throttle use such as a helicopter sim? Not so much. 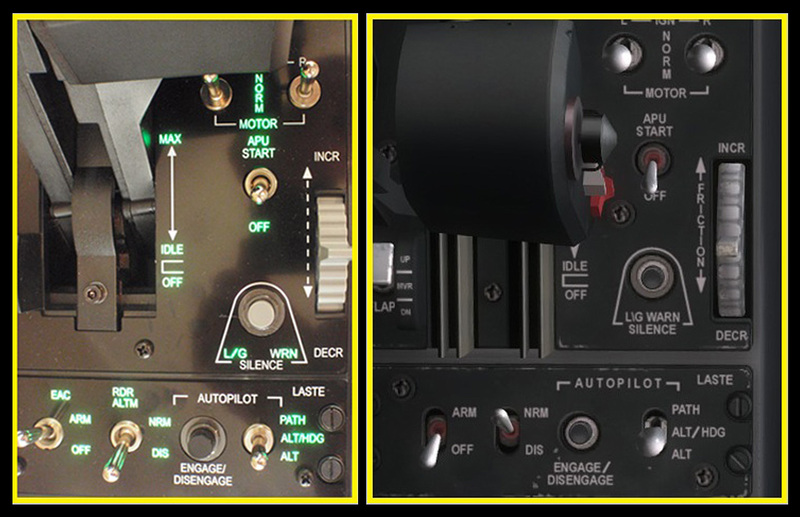 The second small gripe is that the HOTAS Warthog throttle base is so specifically geared toward the A-10C that you’ll have to do a little suspension of disbelief when you are using it with other sims and you have the switches mapped to something other than what the illuminated lettering tells you they are. I definitely see a market for someone to design an overlay for the top of the throttle base that will allow you to custom label the switches and buttons so that they reflect more accurately platforms other than the A-10C. 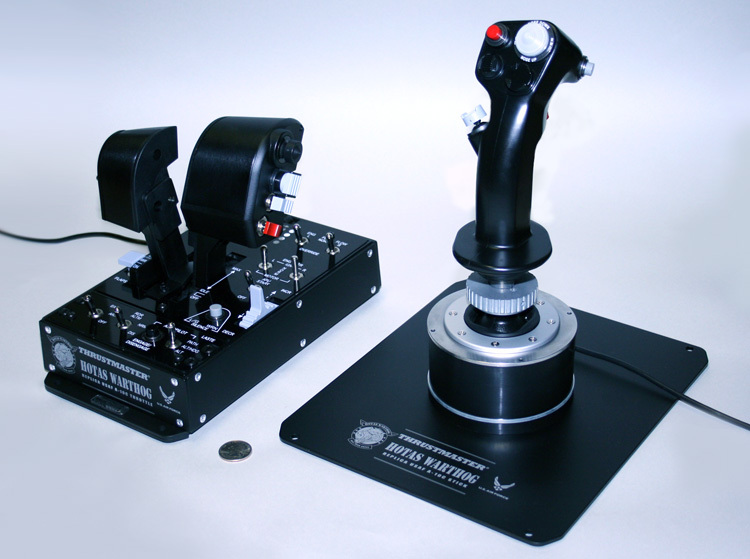 In summary, specifically regarding the Thrustmaster HOTAS Warthog and DCS: A-10C Warthog, there has never been a better match of out-of-the-box hardware and software capability that this reviewer has ever experienced. It feels. Well, “gooood”. Obviously, while the Thrustmaster HOTAS Warthog is designed to best mesh with DCS: A-10C Warthog, I also wanted to take a look at how it felt with some other popular (albeit older) sims.